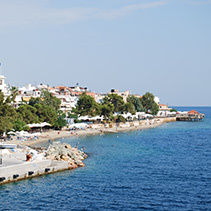 Situated in Loutra Edipsos on the beautiful island of Evia, in the heart of the city, the Omiros Hotel is just few meters away from the port, the beach, the spa baths and the market. 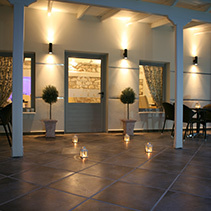 The Omiros hotel is a new option for your accommodation in the region of North Evia. It's owner, Leonidas Koutsikas, who spent 20 years living in Italy, has successfully managed to “transfer” elements, colors and ambience, from this magnificent neighboring country, and give the hotel a unique personality, through its architecture and design, which was personally chosen. The hotel is a new building that combines luxury, modern comforts, a friendly atmosphere and promises special moments of relaxation and enjoyment during your stay. 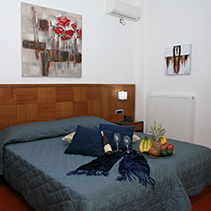 There is 1 suite and 13 double rooms, fully equipped, with each one having its own unique character and personality. The rooms are all very comfortable and carefully furnished, providing accommodation of the highest quality. 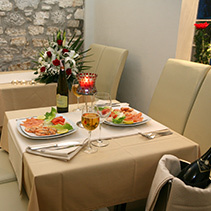 The meeting point of the hotel is the warm reception hall with its bar, which offers a very warm welcome to all guests. The same quality and hospitality is also offered at the sun kissed café bar Omiros which is situated in the hotel’s garden. The romantic atmosphere of the hotel, and the polite service of our staff, provides the essence of our warm hospitality, while the unique beauty of the scenery, in combine with the historical sites, and the various recreational activities promises an unforgettable stay.